It is a truism that politics is the art of compromise, but in Washington, DC compromise only moves in one direction – toward the Democrats. The prefect example of this is the Democrats’ position on spending, where their idea of a spending “cut” is to slow the growth of spending without actually reducing the amount spent. But the Democrats’ redefinition of compromise is even more obvious on the southern border wall. The Democrats’ first tender was to continue the existing appropriation of $1.6 billion, restricted to prohibit construction of anything remotely resembling a border wall. When President Trump responded by saying $5 billion with no restrictions the Democrats walked away and effectively shut down about 25 percent of the government. 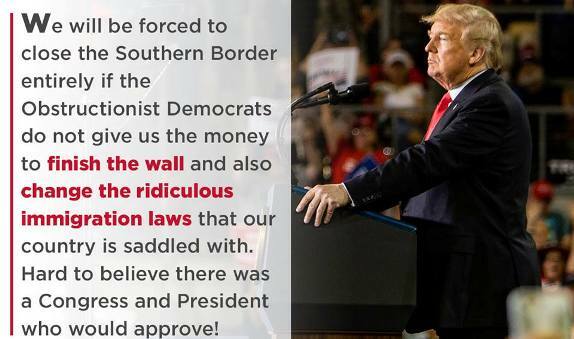 Now they’ve revealed their real agenda – no wall funding at all. On New Years Eve Democrats in the House unveiled two bills to fund shuttered government agencies and put hundreds of thousands of federal workers back on the job. They planned to pass them as soon as the new Congress convened Thursday, one of the first acts of the new Democrat-controlled House. “It’s simple: The Senate is not going to send something to the president that he won’t sign,” Stewart said according to reporting by Zeke Miller and Lisa Mascaro of the Associated Press. However, the Democratic package to end the shutdown would include one bill to temporarily fund the Department of Homeland Security at current levels, with $1.3 billion for border security — far less than $5 billion Trump has said he wants for the wall — through Feb. 8 as talks continued. In other words, they are right back where they started – no funding for the much-needed wall on our southern border. And where else could they be with Democratic Speaker-in-waiting Nancy Pelosi saying, “We, most of us, speaking for myself, consider the wall immoral, ineffective and expensive and the president ... promised Mexico would pay for it. So even if they did, it's immoral still, and then they're not going to pay for it." According to Zeke Miller and Lisa Mascaro of the Associated Press the president has not said he would veto the Democratic legislation, if the bills were to land on his desk. But the idea of clouding Pelosi’s speakership only emboldened Trump, the officials said. A prolonged crisis could hobble House Democrats’ ability to launch their agenda, which included investigations of the president and oversight of his administration, including Russian interference in the election. At least one Republican, South Carolina Sen. Lindsey Graham, encouraged Trump to use the budget impasse as an opportunity to address issues beyond the border wall report Miller and Mascarp. But a previous attempt to reach a compromise that addressed the status of “Dreamers” — young immigrants brought to the U.S. as children — broke down last year as a result of escalating White House demands. Graham said Trump was “open minded” about his proposal reported Miller and Mascaro. The partial government shutdown began Dec. 22 after President Trump chose to fight to make good on his vow and secure funding for the wall before Republicans lose control of the House on Wednesday. So, where’s the avenue for compromise? It might be for the President to take less than the asked for $5 billion, or it might be for Democrats to ask for something else to sweeten the deal, such as Senator Graham’s suggested fix for the so-called “dreamers” (something we would not like) or it could be a host of other things that Democrats have traditionally had on their agenda. But none of these compromises are available because Democrats have remained committed to blocking any funding for the wall in their drive to make Donald Trump a one-term President. Submitted by email_registrat... on Wed, 01/02/2019 - 14:31. Yes, it seems the 'government' has reached an impasse. Notice I said government, it has nothing to do with Pres. Trump. Republicans never have had his agenda in mind democraps, so I even have to say? However, they should be very concerned. Impeach Pres. Trump and they have a revolution while Mike Pence steps in and he is more of a nightmare to them than Trump. Pence is a politician and knows how to play the game. Something they seem to be forgetting, at last check the #walkaway movement was 200,000. Add to that EVERY country that has turned communist, socialist for slow learners, has failed miserably. The President can not get funding for the wall? Be like my men and me, become a wall. A WE THE PEOPLE wall. Submitted by email_registrat... on Wed, 01/02/2019 - 14:00. I am a contractor to ICE. In all past shutdowns the federal employees received their back pay (didn’t even have to make up any hours). But contractors have never gotten a dime. A why? We are taxpayers too. We deserve to get paid just like the feds. Why should they get a free vacation while I take a 2% reduction in annual income for every week of the shutdown??? If this lasts 3 months I will lose 25% of my annual pay! How am I supposed to pay my mortgage and card for my family??? Just to be clear: I fully support the wall and general increases in border security. But why should select citizens be unfairly targeted with an unfair “tax” (penalty)? All sides need to negotiate in good faith and resolve it. I voted for the President. But he needs to understand that he doesn’t have the votes to demand anything. He didn’t before and with the new Congress he has even less leverage. Democrats need to get over their TDS (Trump Derangement Syndrome) and start acting in the best interest of American citizens and taxpayers. Congress and the White House need to ensure that Contractors receive the same treatment as federal workers do with regards to back pay. Submitted by email_registrat... on Wed, 01/02/2019 - 12:29. Polosi should be ashamed of her self for going on vacation! She cares not what the people thinks of this self serving viper! Apparently she doesn't want to get anything done. It takes the senate to pass legislation and the republicans have the majority and I suggest that she compromises if she wants to get something done! I'll always agree with POTUS and will stand behind him when it comes to the border's I don't see alot getting done for the next two years? Submitted by email_registrat... on Wed, 01/02/2019 - 14:39. I don't see much getting done in government either at any time. Like you, the Midnight Rattlers, Texas Minute Men and countless other veterans also always agree with POTUS and will stand behind him when it comes to the border."